Taf Schaefer Design, in concert with fly fishing legend Lefty Kreh and the not-for-profit conservation organization Stripers Forever, announces a fund-raising project with the issuance of a bronze belt buckle featuring a sculpted version of the world renowned “Lefty’s Deceiver” fly. The buckle, crafted by well-known designer/sculptor Taf Schaefer, has been fully endorsed and signed by Lefty Kreh, the father of fly fishing and creator of the original Deceiver Fly. Schaefer’s buckle design was inspired by the Deceiver Fly personally tied by Lefty in 2016 and sent to the highly respected artist Sam Aronson as the model for an original painting sold at auction to raise funds for striped bass conservation. The painting, a huge success, spawned the idea of creating a limited edition, signed bronze “Lefty’s Deceiver” buckle. Taf Schaefer, the acclaimed designer/sculptor whose work is collected worldwide (see bio below) was chosen to design the Deceiver buckle because of her reputation and expertise in creating custom belt buckles and her involvement in the conservation community. Together, Taf and Lefty have been working on the buckle design for more than a year. After the design was finalized and approved in the summer of 2017 Lefty authorized Taf to cast his signature on the face of 100 Limited Edition Deceiver buckles. The signed, Limited Edition buckle with a leather strap, all made in the USA, is priced at $350.00 each. In addition to the signature “Lefty” on the front, Taf’s name will appear on the back along with the defining words “Lefty’s Deceiver” and the engraved edition number. 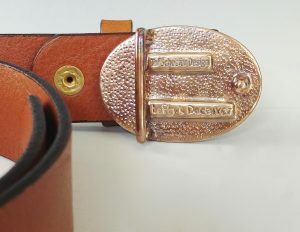 The Standard “Lefty’s Deceiver” buckle and belt, minus Lefty’s signature on the front but including the wording on the back is priced at $175.00. All sales channels will be utilized with the resulting net profits being dedicated to wild striped bass conservation. Signed, numbered buckles will be reserved on a first come basis. Taf Schaefer was inspired by her early years on Cape Cod, where the freedom to explore the surrounding beaches and oceans created a personal nexus for her between art and science. Building on that inspiration Schaefer uses research and hands on modeling and carving to realize her designs. Accordingly, her work is highly collectable as evidenced by her position as the top selling designer at Steuben Glass for 15 plus years. Whether it’s carving stone, sculpting wax, designing glass or creating collectible belt buckles in silver, bronze and brass, Taf’s process involves an immersion in research, a drive to explore materials and taking on challenges that expand her horizons.